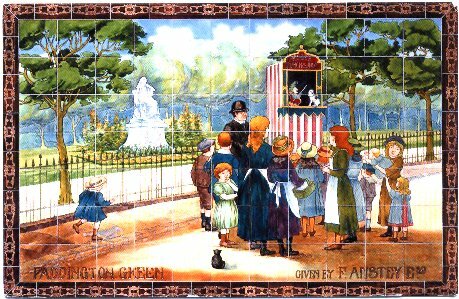 Tile picture with Bailey's Punch and Judy show on Paddington Green, from the nearby Children's Hospital, now closed. Picture restored by Heritage Tile Conservation Ltd. Published as a greetings card by the Punch & Judy Fellowship.